Reduce the risk of loss of life and property due to fires, explosions, and CO with the new NFPA 302 Standard. Follow current fire safety and life safety requirements for boats (less than 300 gross tons) that are used for pleasure and commercial purposes. Owners, manufacturers and marine surveyors will find the 2015 NFPA 302: Fire Protection Standard for Pleasure and Commercial Motor Craft indispensable for properly protecting boats from fires and related hazards. Standard specifies requirements for fuel systems and fire protection equipment, lightning protection, and installing electrical systems (ac and dc). NFPA 302 covers it all, from explosion prevention to CO mitigation. Changes for the 2015 edition reflect new safety knowledge. Updated extracts from NFPA® standards including the 2013 edition of NFPA 10, 2011 NFPA 12, 2009 NFPA 12A, and the 2012 NFPA 2001. Keep people and facilities safe during boat construction, conversion, and repair. 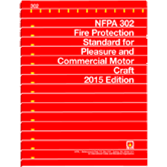 Interested in other editions of NFPA 302? Use the drop down menu above to select the edition year you need.